ACT-25B Electronic Autocollimator and Alignment Telescope | PLX Inc.
Used to detect and measure small angular deviations. Exceptional focusing range: from 30cm to infinity. Built-in laser for coarse alignment. Long lasting LED light source. Full-featured software suite allows you to record and document your measurements. Connects to your computer via a USB port. Fully integrated mount and leveling capability. Complete with full software suite for recording and documenting measurements. The new PLX ACT-25B Electronic Autocollimator and Alignment Telescope is a robustly designed all-in-one unit. The ACT-25B Autocollimator is a high-accuracy measurement instrument capable of resolution down to fractions of an arc-second. It features a built-in laser for coarse alignment, a base with leveling adjustments and bubble level and focusing adjustment. Because of its high-quality CCD detectors high sensitivity, even very faint back reflections will be captured and displayed. When the ACT-25B is used as an autocollimator the unit has a 42-minute horizontal measurement range. In alignment telescope mode, the field of view is 84 minutes horizontally. The PLX ACT-25B autocollimator has a 0.1 arc-second resolution and a focusing range from 30cm to infinity. A unique feature of the ACT-25B is the ability to focus down to 30cm (12 inches) in the telescope mode. This capability allows the measurement of lateral displacements, as opposed to the autocollimator mode, which measures angular displacements. For an even greater resolution capability see our ACT-HR. The ACT-25B is designed as a complete system and is practically ready to use right out of the box. The software suite automatically displays angle deviation and can give the relative position of multiple targets. Accessories for the ACT-25B include Hollow Retroreflectors, Lateral Transfer Hollow Retroreflectors (LTHRTM), Lateral Transfer Hollow Periscopes (LTHPTM), Tool CubeTM and cooperative target . Applications: For machinery alignment the Autocollimator / Telescope can be used for checking the accuracy of machine slides. Optical testing: The electronic autocollimator can be used for testing various optical components. Some measurements may require the use of supplemental optics. Additionally the PLX ACT-25B Autocollimator is valuable for Boresighting applications. The Autocollimator/Telescope can be used for checking the accuracy of machine slides. To check the slides, mount a mirror to the machine table. The mirror is facing in the direction of travel. The autocollimator is aligned to the mirror, and the table is then moved either continuously or in discrete steps. Any error in the movement of the table shows up as the reticle image moving. The electronic autocollimator can be used for testing various optical components. Some can be measured directly, and others would require the use of supplemental optics. When using the autocollimator mode, it is important to understand the display readout. The autocollimator scale is set up to measure mirror tilt, not the beam angle. When a mirror is tilted, the reflected beam is deviated by twice the angle of the tilt. Boresighting is the aligning of a targeting system or systems with the barrel of a weapon, or the co-alignment of different targeting systems (visible and infrared). Boresighting will typically require some additional set-up/equipment. This could take the form of an accurate translation stage or an LTHR or periscope possibly equipped with a beam splitter. The set-up here is highly dependent on the configuration and number of objects being bore-sighted. The software automatically displays angle deviation and can give the relative position of multiple targets. Data logging is supported and can be configured to record for a predetermined time or a fixed number of data points. The recording interval can also be set. The data can be saved to a file or streamed to a remote location via RS-232 or TCP/IP. The communication setting for both RS-232 and TCP/IP is fully configurable from the software. Metrology System for Inter-Alignment of Lasers, Telescopes, and Mechanical Datum: Poster Presentation at OPTIFAB. Advances in sensor technology have opened the door to new measuring instruments, initiating the development of the new PLX, ACT-25 and ACT-HR Electronic Autocollimator and Alignment Telescope Systems. 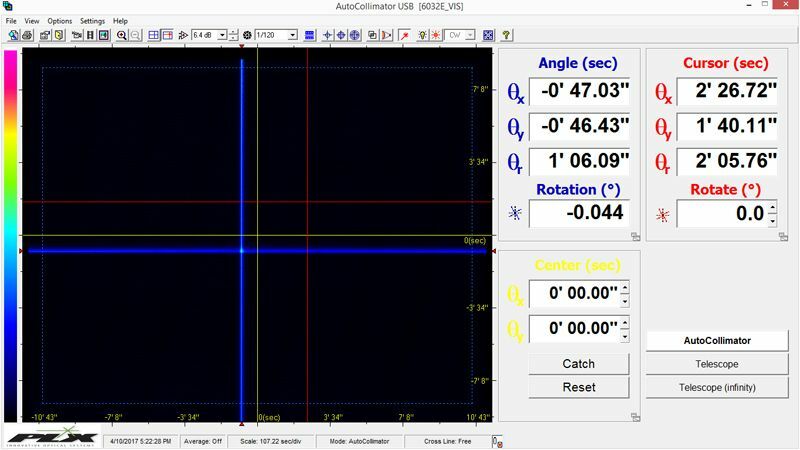 The technology is based on autocollimation principles combining laser beam collimation and direction measurement, accurate telescopic measurement, focusing techniques with sophisticated software and computing techniques. Of special interest is the laser analyzing autocollimator since it combines laser-analyzing technology with angular reflection technology. PLX’s "Metrology System for Inter-Alignment of Lasers, Telescopes, and Mechanical Datum” abstract / manuscript accepted at SPIE for inclusion in their Library of Technical Papers. In modern scientific and industrial laser applications, inter-alignment of multiple optical devices is frequently a basic requirement to meet a certain specification and performance.